Dr. Suleman did his PhD from Tokyo University and postdoctorate from Georgetown University. 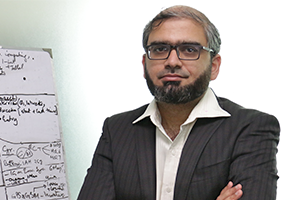 He has a vast portfolio of research projects as principle investigator of BiSMiL Lab(Laboratory for Bio-inspired Simulation & Modeling of intelligent Life). He is HEC approved PhD supervisor and IEEE senior member (SPS, CS, OES, RAS, SMC-Soft Computing). He is member of Acoustical Society of America and World Commission on Protected Area/International Union for Conservation and has rendered Technical Committees services in IEEE SMC (2014), iCREATE (2014), WFAR (2014), IBCAST (2011-2014) and FIT (2012,2013). He is member of MAAP (Alumni association of Japanese Monbokagakusho Scholarhip) and State Alumni (Alumni association of U.S. Government-sponsored exchange programs).